The Korean Peninsula used to have a single nation with a high degree of ethnical homogeneousness, which today has been separated into two countries: the Democratic People's Republic of Korea (DPRK) in the North and the Republic of Korea (ROK) in the South that are commonly known as North Korea and South Korea respectively. The division of Korea occurred between 1945 and 1948 according to an agreement between the Soviet Union and the United States, followed after the surrender of Imperial Japan in the second World War. The subsequent Korean War from 1950 to 1953 changed the two Koreas' boundary along the 38th parallel into the demilitarized zone (DMZ) which is situated roughly in the middle of the Peninsula. The Korean War left a massive physical and economic damage to the nations. Since the interaction between the countries including trades, transportations, and communications was officially discontinued overnight, a number of fragmented family members have been forced to live apart from each other. For the separated families who do not even know whether their family members have survived, the two governments have irregularly organized the inter-Korean family reunions since the first arrangement in 2000. As of June 2016, those who passed away outnumbered those who were alive among the family reunion applicants. North and South Korea have run an arms race over the past decades, which has ratcheted up the tensions between them, while there have been cooperative movements across sectors such as international trade, the Kaesong Industrial Complex, and most recently, their joint participation in the PyeongChang 2018 Olympic Winter Games. In general, the inter-Korean relations have been subject to the governmental policies towards the counterpart. South Korea adopted a Sunshine Policy to seek an active engagement with the North from 1998 to 2008 and has implemented a New Northern Policy under the presidency of Moon to ultimately establish peace on the Korean Peninsula. Despite around 5,000 years of history shared in the united Korea, the prolonged division has brought about differences in almost every aspect of the Korean societies including economy, political system, language and culture. Regardless, the necessity as well as the possibility of Korean reunification has widely been accepted in South Korea according to the perception survey. 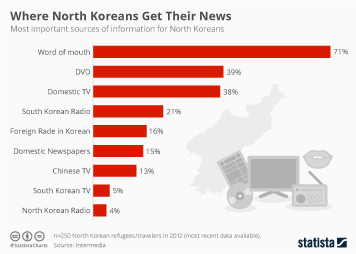 In addition, the majority of population has been positive about allowing defectors from the North to enter South Korea. More interesting topics from the industry "Politics & Government"